M.Scott (1626) - J.Edwards (1730), Grangemouth Challengers, 2007. White (to play) failed to see the game winning shot - Can you? this are all about forcing replies. No time for quiet captures. says every time he appears on Chandler Cornered I make fun of him? Come to the board wearing a wig, a false beard and a Man Utd top. Man Utd top. Then get a mate to sit in his chair. sitting and lose on time. mated by getting back rank mated in all your games. People will think this is your normal behavior. book marker and the pages can be used to light cigarettes. Pawn=Friday and no chess piece means it's a Saturday. on the first rank then put the pieces on top of them. to give you a rough idea how your development is coming on. and then arrange them as a chessboard. Have a pile of almonds on the Queenside of the board. on the Kingside. This will tell how many moves you have made. Staunton Chess sets by sawing the King in half and counting the rings. from the table by playing on the floor. (see next tip). them in a dollop of treacle. (see previous tip). don't turn up when they play league matches. Watch the defaults mount up. Tie a thin piece of fishing line to your g-pawn. the pawn is on g3 and then take his Queen. Now do you remember this game? 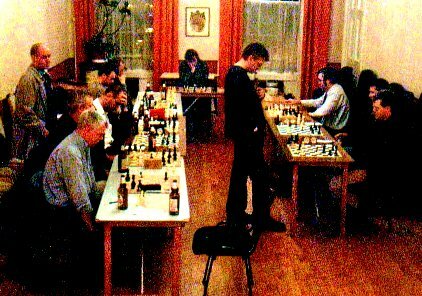 brother in 8 moves at the 2007 Lothian Secondary Masters. games is P.8 W1 D1 L6. I expect Rhian to send in her other 5 wins. She comes to grief here due to the uncastled King and a weak f7. I took this naff picture without a flash it's pretty bad. serious. Look at this position - White to play. let it go in order to activate his pieces. Even so Black had all the chances in a complicated position. was calling the shots and could have/should have gone two pawns up. Make some white chess pieces out of icing sugar. During the game place them amongst the captured pieces. Suddenly pop one into your mouth and crunch it. Then offer your opponent a draw.